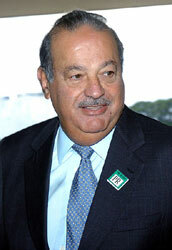 Carlos Slim has good prospects to become Telekom´s second-biggest shareholder. The Austrian magazine „News“ reports that Slim purchases a 4.0% stake in Telekom Austria. It is assumed that the Austrian investor Ronny Pecik and Slim agreed on a deal. Pecik´s shares may be sold at a price of € 9.50 per share.